In today’s changing world and social climate, schools are encouraged to implement lock down plans and procedures to ensure the safety of pupils and staff. Effective communication is on of the key principles of 360 degree safety. The deployment of a public address system is often overlooked in schools across the UK and something that has been in place for many years in the US and in European schools. A public Address system allow messages to be conveyed quickly and efficiently across a site. This will include anything from the need for a member of staff or a pupil to report to the office, to the raising of an alarm due to a potential emergency situation. 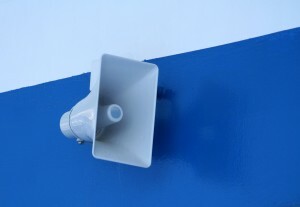 Public address systems are generally assumed to be a 1-way system to allow announcements to be made and this typically isn’t found in UK schools. If your school should face an intruder threat or a serious emergency staff need a simple and automated emergency protocol to raise the alarm or the need for a school lockdown. The use of a multi-function public address system is a good way of achieving this, whilst adding other useful functionality. SchoolCare’s SchoolSafe lock down and public address solution is an effective Public Address system which quickly and cost effectively deployed that allows staff to address other staff members and students at a volume that everyone can hear to gather important information. SchoolCare’s solution is an IP based public address and lock down system that includes features over and above the standard functionality of a public address system to page messages across the school. The public-address system can be setup and configured to allow staff, pupils and visitors to be located, play class change tones, play background music and in the event of heightened security, broadcast lock down alarms throughout the school. In an emergency situation, the security protocols on the system take priority over any other scheduled tasks. Traditional PA systems require a large amount of infrastructure and cabling which makes the whole PA system deployment very expensive. SchoolSafe speakers are connected directly to the schools existing wired network. The control system can have several devices connected to it such as paging microphones, break glass triggers for full and partial lock-down, or a touch screen to play specific announcements. The SchoolSafe lock down system can also have panic buttons installed in the classrooms which all connect back to the schools existing network. The panic buttons can be used to alert the front office should there be the need for emergency assistance in the classroom. Pre-recorded emergency messages or tones can also be stored on the system for use in emergency situations which can all be triggered securely using traditional call points or from pre-determined areas. Contact SchoolCare today to see how a public address system will benefit your school environment.